Whenever I read Jane Austen's classic novels, I always come away feeling like they're missing a certain something. Now I know what it is. ZOMBIES. Fortunately, an enterprising author has put his heart and soul (and possibly his brain) into improving Austen's best-loved work. 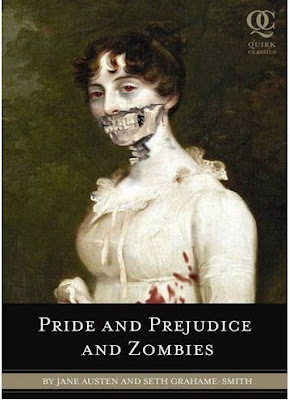 The result: Pride and Prejudice and Zombies. From the Amazon description . . . Pride and Prejudice and Zombies" features the original text of Jane Austen's beloved novel with all-new scenes of bone crunching zombie action. Awesome. Now why didn't I think of that? Thats sounds like a good book, but I don't think my mom will let me read that since I can't even read Twilight. YES! FINALLY, A WAY TO READ AUSTIN! I've been unsuccessfully attempting to read Jane Austin's works (Emma particularly) for the past five months, both for school and for pleasure (which, as you may guess, I haven't been getting much of). With this, I suppose I'll find what I've been looking for! Good! I definetly thought J.A. 's book needed some sprucing up!! awesome! i cant wait to read it! Sounds strange... I don't know if I'll read it, though. 50% of me is like "That's AWESOME!" and the other 50% is like "That's awful and disgusting!" I think the majority of the classic books would benefit from a little zombifacation. Oooh, I'd love to have a read of that book! Here you have a traditional English novel with....ZOMBIES! Why didn't I ever think of that either? "Bone crunching zombie action" I like that. I am not a super fan of zombie books in general, after you have read one you kind of know how the others will end, but this sounds interesting. ew. just ew. Not everything has to be filled with "bone crunching" to make it interesting. Cant they let the classic alone? Sorry but that just bugs me. Kind of scary cover art...I haven't read Jane Austen so I am not opinionated. I have watched the Masterpiece Theater versions, though! I remember them as being quite good. OMG I am always missing why there isn't any (at all) action in those books. No offense JA. i get it now! That is the best idea I've heard in a while! The 4 hour movie version (forced to watch it my my mother. Can't stand Austin anymore)would be so much better with bone crunching! Anonymous#1: wow. That is exactly my situation!!!! i have a question, are there any boys on this site???? not that i am a boy! just wondering. I DO NOT Condone This! Forget Cards. This is the Ultimate V-Day Gift! Black Squirrels Take Over Britain?